Are you struggling to parent? Do you feel alone on your parenting journey? You are not alone! This may be one of the loneliest journeys you could walk. However, finding other families to walk beside you is vital. But where can you find a support network? Social Media. There are a number of groups on social media where you can connect with other families who are parenting adopted children. Groups on parenting with connection, older child adoption, parenting adopted teens, and adopting out of birth order are just a few groups you could search. Many other groups focus on families who adopted from a specific country. Get creative in coming up with key words that fit what you are looking for. Request to join a group, but if you find it is not what you expected or you find it bringing more heaviness instead of helping lift your heaviness, do not be afraid to exit the group. Thankfully, it does not have to be a long-term commitment if it is not a good fit! Area Support Groups. While groups on social media can be fulfilling, there is NOTHING quite like meeting people in real life. (And it is possible to meet via social media yet become real life friends!) But people in your community you can meet one-on-one or as a small group can be helpful as well. Many churches have begun to create adoption support groups. Several larger churches have groups, but even some smaller churches have responded to the call to fill this void. Agencies often have support groups for their families as well so if your agency is local, get involved in their support group. If your agency is not local, contact some of the local agencies to inquire whether they have a support group you could join. Most agencies have a desire for ALL adoptive families to be successful (regardless of what agency helped you adopt) and would welcome families seeking to connect with others. Adoption-educated Friends. Ok, so maybe social media isn’t your thing. And maybe you have tried to find a support group and have been unsuccessful. Create your own! Select friends (or find new ones) who are willing to become educated about the unique challenges of adoption. Those who are willing to not pass judgement when you share some of the hard aspects of your journey. They may be the people you least expect! However, they can serve as a great listener and a great encourager to you. 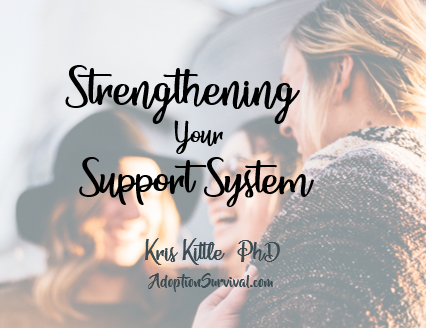 I hope that you will commit to strengthening your support system to help you through the bumps guaranteed to occur in parenting.